Egypt's President Abdel-Fattah El-Sisi took all by surprise when he announced on Monday that he supports amending a controversial NGO law passed in 2016. On the second day of the World Youth Forum on Monday, held in the Red Sea resort of Sharm El-Sheikh between 3 and 6 November, participant Yostina Tharwat appealed to El-Sisi to invoke his constitutional powers to request a revision of the NGO law passed by parliament at the end of 2016, which she said has caused a lot of controversy. 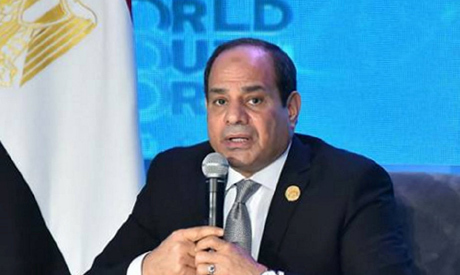 "I suggest that a committee be formed to hold hearing sessions on the NGO law and that state authorities move to submit an amended version to parliament," El-Sisi said. The president pointed out that there are more than 50,000 NGOs and civil society organisations operating in Egypt and are doing superb work, adding that the state is keen to ensure that the law regulating their activities is balanced and lets them operate efficiently and effectively. At the end of the forum on Tuesday, El-Sisi declared the adoption of 10 resolutions, at the top of which is holding a comprehensive national dialogue on amending the NGO law. El-Sisi said the cabinet will be entrusted with forming a committee comprising the ministries of social solidarity, foreign affairs, and other concerned parties, particularly the National Council for Human Rights and civil society organisations, to create a new version of the NGO law. "This committee should forge a new comprehensive vision on the law regulating the performance of NGOs in Egypt, taking the experiences of other countries in this respect into account, and holding a national dialogue on the proposed amendments, provided that young people participate in this dialogue,"El-Sisi said, adding that "the amendments should be submitted to parliament in the end." The NGO law, passed in November 2016 and ratified by El-Sisi in May 2017, triggered criticism in some foreign countries, particularly in the US Congress, where some members demanded part of America's economic assistance to Egypt be withheld to protest legislation that they described as repressive and undermining of the activities of NGOs. Although MPs said they welcome any amendments to the law, they agreed that the law has not yet gone into effect, so one cannot say that some of its articles are flawed. Mohamed El-Ghoul, a member of parliament's human rights committee, told Ahram Online that the law was mainly drafted by parliament's social solidarity committee. "When it was passed in November 2016, it was keen to make a balance between national security concerns and freedom of civil society activities," El-Ghoul said, adding that "the executive regulations of the NGO law have not yet been finalised." "So, the view of many MPs is let us wait until the regulations are finalised and the law goes into implementation so that we can judge whether some of its articles are flawed or whether prove restrictive to civil society activities," El-Ghoul said. El-Ghoul said "President El-Sisi was not clear on what articles of the law are flawed, but maybe he has information that we do not have, and as a result he has asked for amending the law." "El-Sisi is acting as a president who has all the information necessary on national security, and so he believes amending the NGOs will serve Egypt's national security in the coming stage," said El-Ghoul, adding that "of course MPs will welcome any amendments that serve the higher interests of Egypt." Samir Ghattas, a political analyst and an independent MP, also told Ahram Online that "the NGO law drew a lot of criticism in Western circles, particularly in the United States." "All state officials, at the top of whom is President El-Sisi, took note of this criticism, which led at one point to negatively impacting the relationship between Egypt and the United States," Ghattas said, adding that "upon this fact, and as President El-Sisi views the relationship with America as strategic, he has decided that the law should be amended to contain Western criticism in this respect." "It is no secret that several US Congress members, particularly the late Senator John McCain, directed scathing criticism at the law, taking it as a proof that the regime is repressive," Ghattas said. Ghattas agrees that "amending the law, which was drafted mainly by parliament's social solidarity committee, could come in a more balanced way if government experts intervened to draft the law in a way more responsive to internal and external concerns." When the NGO law was approved by parliament in November 2016, MPs focused on the necessity of taking national security concerns into account. They, led by Abdel-Hadi El-Qasabi, head of the social solidarity committee and currently chairman of the parliamentary majority ‘Support Egypt’ coalition, said that the law should mainly address the issue of NGOs obtaining foreign funding. "The foreign money granted to NGOs operating in Egypt has always been a source of funding terrorists and subversive activities," El-Qasabi said. During a visit to the United States in the summer of 2017, parliament speaker Ali Abdel-Aal told a number of congress members that the new NGO is not sacrosanct and can be changed. Abdel-Aal also said that the law mainly targets NGOs using foreign money to fund terrorist organisations or political activities that seek to spread chaos and undermine the state. El-Qasabi told Ahram Online in an interview last month that the NGO law supports the work of credible NGOs and targets only those organisations seeking to use foreign money in an illegal way. "The law states that a national council regulating the performance of foreign NGOs be set up to supervise foreign NGOs in terms of licensing, work and activities," El-Qasabi said, asking "why do some refuse to be supervised by this council as long as they receive their money from legal sources and intend to use it in development activities?" Abdel-Moneim El-Oleimi, an independent MP, indicated that El-Sisi, as president of Egypt, is authorised by Article 123 of the constitution to refer laws back to parliament. "This happened two weeks ago when President El-Sisi sent a law regulating clinical trials and medical research back to parliament," El-Oleimi said. El-Oleimi said "there might be bureaucratic and financial difficulties facing the drafting of the law's executive regulations and that President El-Sisi took note of this, so he recommended the law be amended but only via a national dialogue." Haitham El-Hariri, a leading member of parliament’s leftist 25-30 bloc, also told Ahram Online that "the NGO law adopted a skeptical view towards NGOs." "As a result, it imposed a lot of restrictions in the way of setting up a NGO upon the grounds of safeguarding national security,” El-Hariri said. "We hope this view will change and that the new amendments contain the objections raised by NGOs or even reach common ground with them,” El-Hariri said, adding that "the law drafted by the Ministry of Social Solidarity’s committee, which was rejected by parliament, could be more balanced and go in line with international conventions on civil society and human rights organisations."